My most recent road trip with the Minnkota Bolt brought me 10 miles south of the Minnesota-Canadian border, to the land of corn dogs, carnival rides and country music concerts. I'm talking about the Roseau County Fair, a small-town spectacle that draws thousands to Roseau, Minn., every summer. This was the perfect place to bring the electric vehicle (EV) north and share the driving experiences I'd gathered over the past two weeks. And to get there, I'd be adding the 120-mile drive through the back highways of Minnesota to those experiences. I left Grand Forks on Tuesday with a fully charged battery (195 miles "in the tank"). I drove efficiently the entire way, staying below 60 mph and leaving the climate control at its lowest settings. When I arrived in Roseau, I still had an incredible 117 miles of charge left. I considered this a personal victory. Where is my blue ribbon for driving? 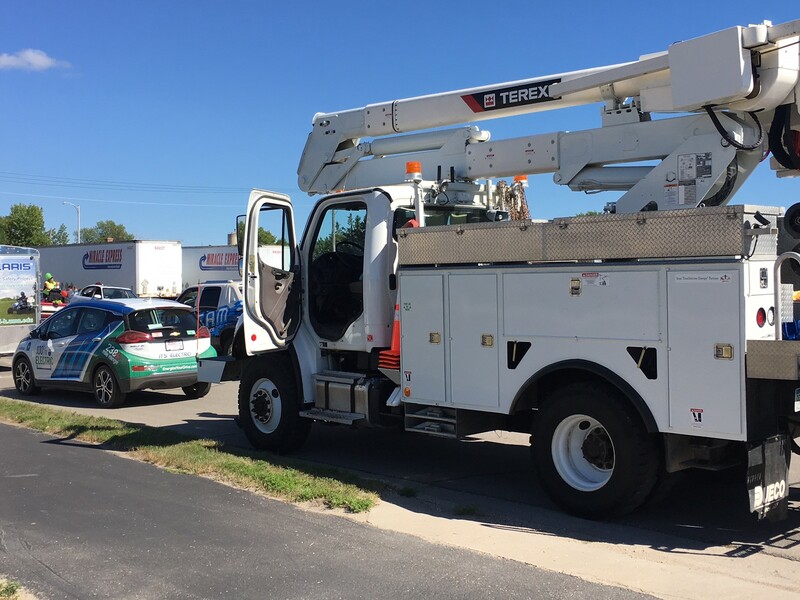 The Minnkota Bolt and the Roseau Electric Cooperative bucket truck were a perfect pair in the Roseau County Fair parade. It was time for the Bolt to make its way through the fair parade, joined by the fine folks at Roseau Electric Cooperative and their bucket truck. I fielded some questions shouted from the sidewalk, like "How much charge do you have left?" and a joking "Where does the gas go?" After the string of classic muscle cars that came before me, people were intrigued by the "100% Electric" branding splashed across the car. 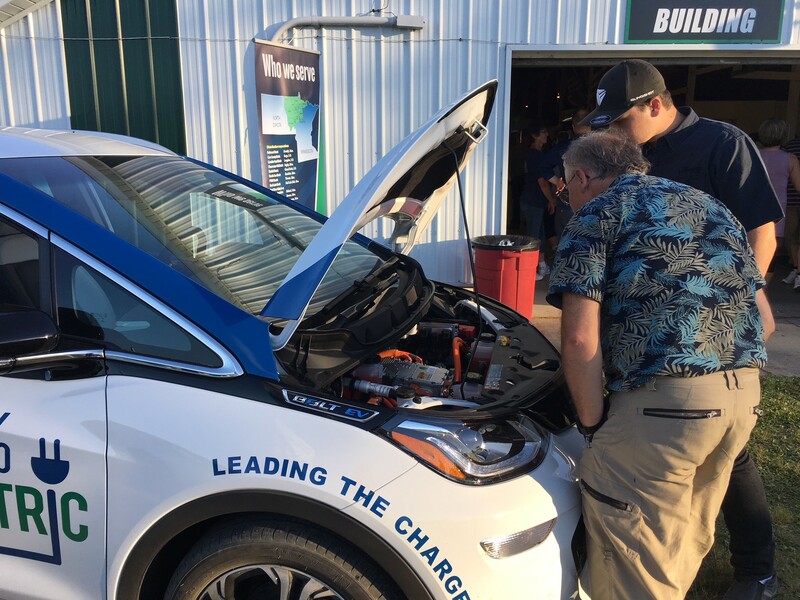 Later at the fairgrounds, I used the Bolt's 120-volt charging adapter to plug in to add a few kilowatts to the battery and to demonstrate to fair-goers how they can find charging solutions while on the road. Three hours later, I had added 15 miles to my expected range. 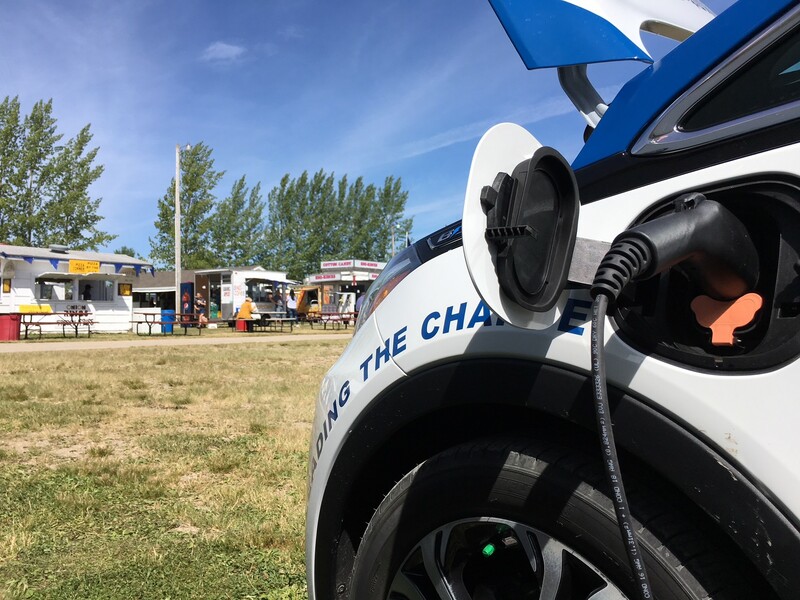 The Bolt's booth and charging outlet was just steps away from the delicious deep-fried fair food - perfect real estate to talk to those hungry for information! That evening I answered an array of questions from an array of personalities. People were most curious about the battery - where it was in the car (underneath your feet), how long it would last (8-year warranty) and how long it would take to recharge (about nine hours with a Level 2 charger). But a close second was concern about the harsh winters that blow through Roseau County - how would this little car fare in those conditions? I was honest. It won't do quite as well, as batteries lose their efficiency when they're cold, sometimes up to 40 percent. But the Bolt will still easily get you where you need to go if you keep it in a warm garage and brush off the heavy snow before heading home. People had a lot of interest in what was happening under the hood. Other hot questions spanned cost ($37,500, or $30,000 with the full federal tax credit), charging options and top speed (93 mph). I had the chance to debunk a lot of myths and misunderstandings about EVs and explain how Roseau Electric could help new EV owners with special charging rebates and off-peak rates. I'd like to think I opened some eyes between the funnel cakes and the Ferris wheel. After an overnight, 11-hour charge at my hotel using one of its block heater pedestals (worked like a charm) and three more hours of charging at the fair, it was time to head back to Grand Forks. I left with an anticipated 185-mile range, and after a two-hour drive in sunny and calm weather, I arrived at Minnkota headquarters with 72 miles left on my gauge. 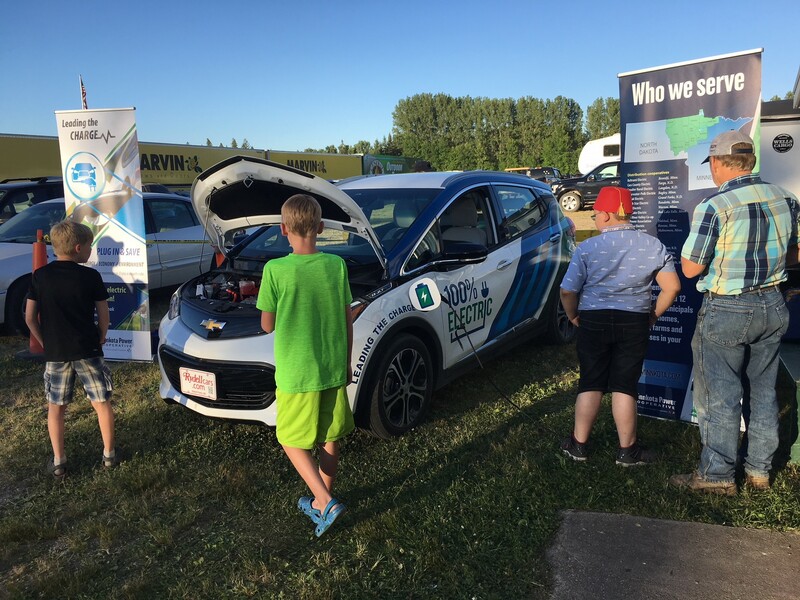 A special thank you to Roseau County Electric Cooperative for inviting me and the Bolt to join them at the fair, for setting me up with a charging outlet and for power-washing away the bugs the Bolt accumulated during the journey. You were all amazing hosts!